When I first saw the Good Lovelies five or six years ago; I remember them being quite good but not a whole lot of other female/harmony groups that were on the Roots circuit at the time; yet here we are with an album that threatens to propel them into the Big Time! While never a Rock band in any shape or form it still comes as a surprise to hear the retro-80’s electro beats that accompany opening song In The Morning; which to my delicate ears detracts from what could be a lovely pop-folk song, as I keep waiting for them to break into something by Depeche Mode. At least on the second track Waiting For You there are guitars and drums; but the punchy drumming overshadows the girls voices on a really good song; that could be excellent in an acoustic version. It takes a while; but by Last Night the Good Lovelies get to do what the Good Lovelies do best and that is purr their way through a well written song to a minimal melody that makes you feel all warm and tender. We even get a mandolin solo to open Old Fashioned Love; and the song is all the better for it; as well as the barroom piano accompaniment. If the album had been sequenced in reverse order I may have liked it more as in The Doe and finally Watching TV we get probably two of the strongest songs on the album; even if the latter song does have a strong Everything But The Girl feel to it. 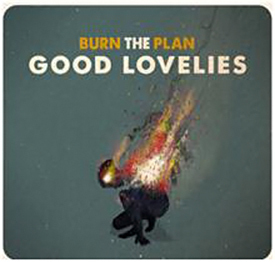 It’s been a challenge to listen to Burn The Plan as it is generally too ‘smooth’ for my personal tastes; but I do appreciate the quality of the individual voices and when they harmonise…..swoon! Plus; on Sunday my wife was tapping her foot to it on a car journey and asked to ‘look at the cover.’ It is now in her car; which probably tells you who the target demographic is.